Despite the occasional hail showers, it was a good day for both trees and birds. 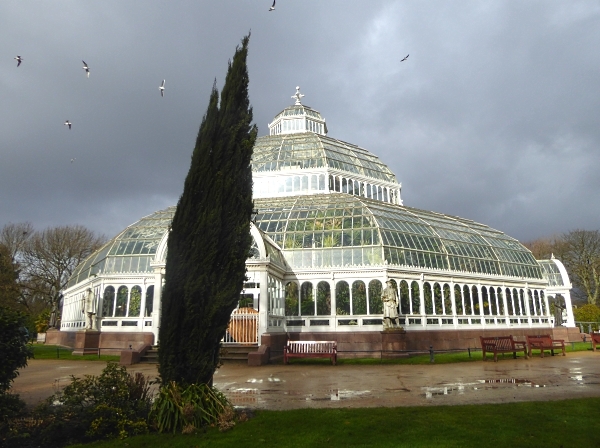 Our very first bird was a Ring-necked Parakeet, calling and flying overhead as we approached the southern end of Sefton Park lake. There was a huge flock of Black-headed Gulls out in the middle, and the usual Mallards, Moorhens and Coots at the jetty end, joined by two Little Grebes. We usually see them in the more secluded area by the island, but they seem to be getting bolder. 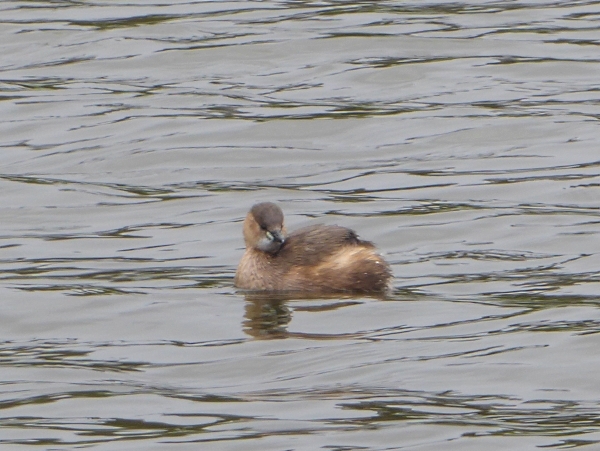 The Canada Geese were honking, head-bobbing and parallel-swimming, getting in their breeding season mood. Several first-winter Mute Swan cygnets were scattered around the lake, perhaps five or six of them. Are they from the astounding brood of nine we saw last September? I suspect that only some of them were. The park cygnets are usually all ringed at the same time, with consecutive codes, but we saw only three with blue Darvics, 4CLY, 4CLZ and 4CUZ, while at least two more had no Darvic rings at all. Had the ringers not been able to catch all nine cygnets last autumn, or are the unringed ones new arrivals from other parks? 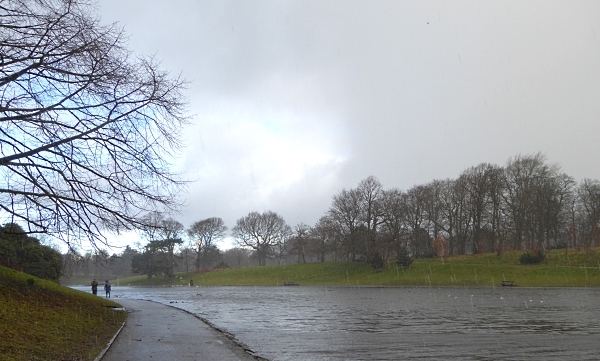 We made our way along the lakeside under hail and a very threatening sky. More Parakeets were flying around in the trees on the western side of the lake. The notices exhorting people to desist from feeding bread to the birds seem to be working, and we saw at least two lots of sweetcorn being offered, with one pile of corn on the far side attracting four Magpies. 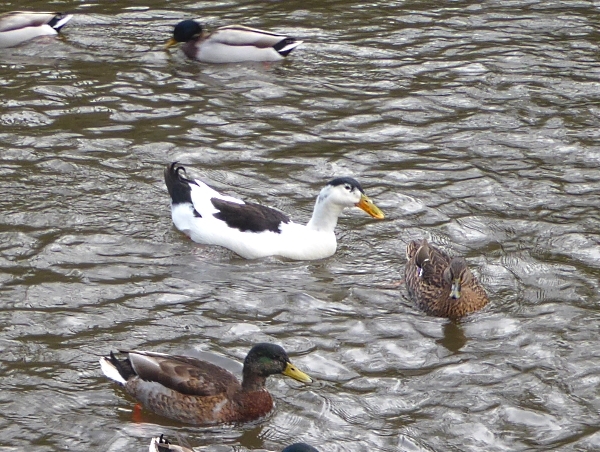 One rather odd duck was in close company with the Mallards. Several trees were old friends. There is a mature Atlas Cedar on the west bank of the lake, unusual because it isn’t the blue ‘Glauca’ variety (as almost all the others we see are) but is apparently the basic green type. Other trees were Yews, Scots Pines, the Narrow-leaved Ash ‘Raywood’, the champion Black Walnut opposite the bandstand and the nearby Weeping Ash. 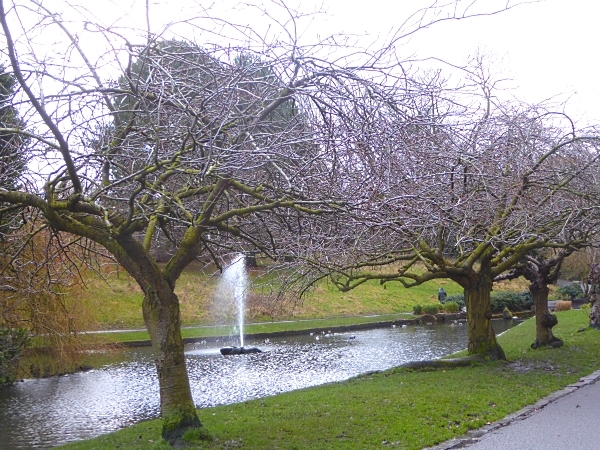 The row of gnarled old Cherries near the fountain had a grey ghostly light on their bare branches. 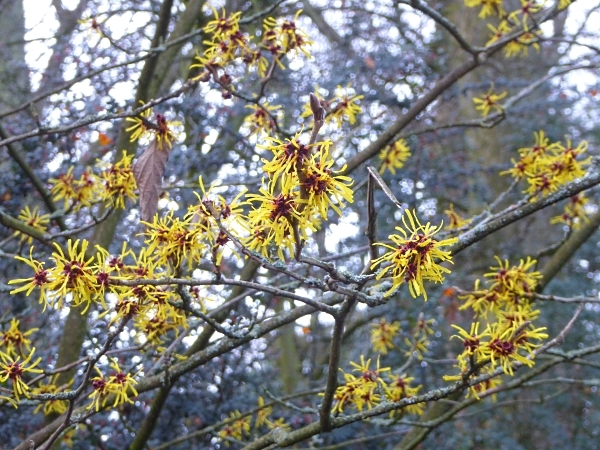 Near the Eros statue is a yellow Witch Hazel with an aromatic scent. In trees near the old bowling greens, a Carrion Crow had picked up what looked to us like an old crisp bag and was pecking at it. Now that I blow up another picture, I can see that it was an empty bag of Mattessons Fridge Raiders (ready-to eat chicken nuggets). 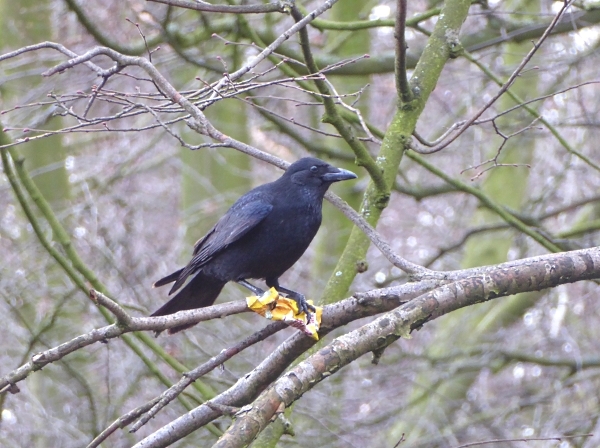 Several other Crows muscled in, and there was a bit of jostling going on for possession of the bag. Was there the smell of the food in it? They didn’t seem to be trying to get into the open end. Or was it just the shiny orange colour that was attracting them? Alongside the path towards the Monument there is a mass of crocuses, not quite at their best yet. There is a young Blue Atlas Cedar by the old aviary, and we started our lunch there, before we were interrupted by more hail. 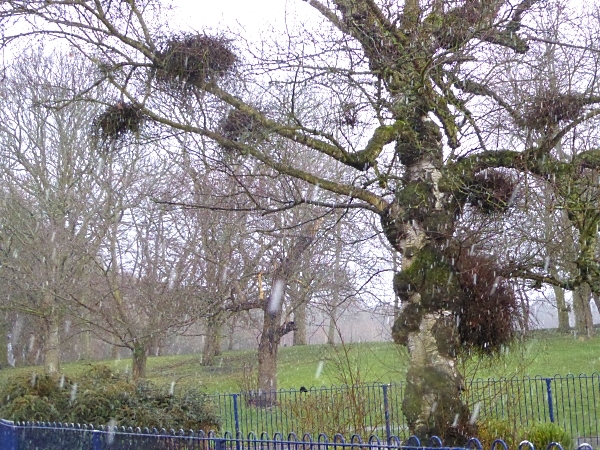 By the aviary path is a Birch infested with Witch’s Broom. 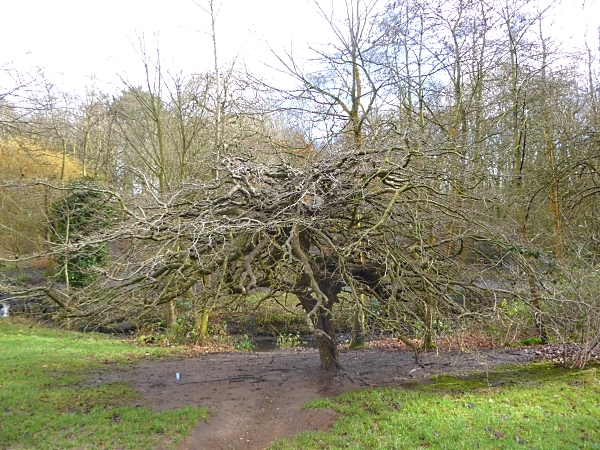 There are many causes, but it is thought that the ones on Birch are usually caused by the fungus Taphrina betulina, which doesn’t kill the plant, just makes these twiggy excrescences appear. 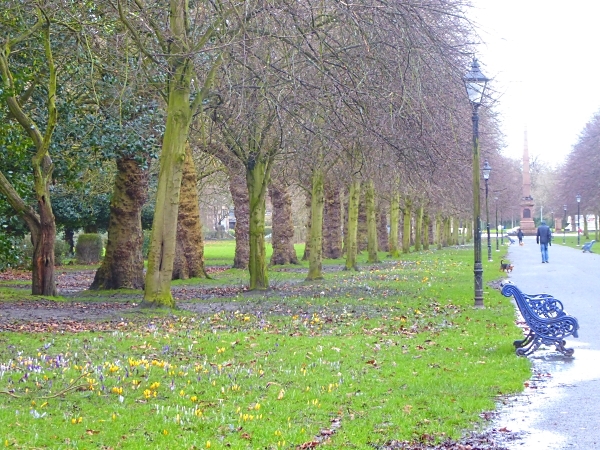 We passed the magnificent avenue of mature London Planes on the way to the Palm House. The beds surrounding it contain two kinds of palm. The one with the plain trunk and long strappy leaves is a Cordyline Palm, also known as the Cabbage Tree, while the ones with hairy trunks and fan-shaped leaves are Chusan Palms, like the ones in St John’s gardens. 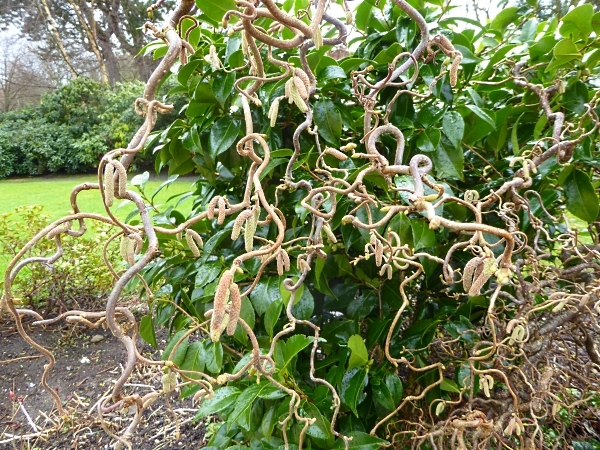 Near the Darwin statue is a Corkscrew Hazel, also known as Harry Lauder’s Walking Stick. Next to the Hazel is an elegant slim Cypress tree of some kind, listing to one side. It had large smooth-scaled cones, looking rather like something’s droppings! It spoke to me of Tuscany, I have to say. 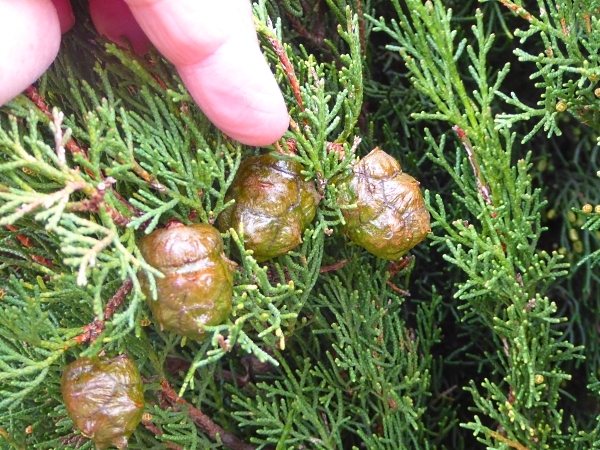 When I looked it up at home I identified it as an Italian Cypress, Cupressus sempervirens, classed as “uncommon”. It’s a new one for me. In the Fairy Glen there’s a readily identifiable Deodar Cedar. There had been lots of recent trimming and digging in the shrubberies, with much of the soil looking well rooted-over as if a troop of wild boar had been through it. 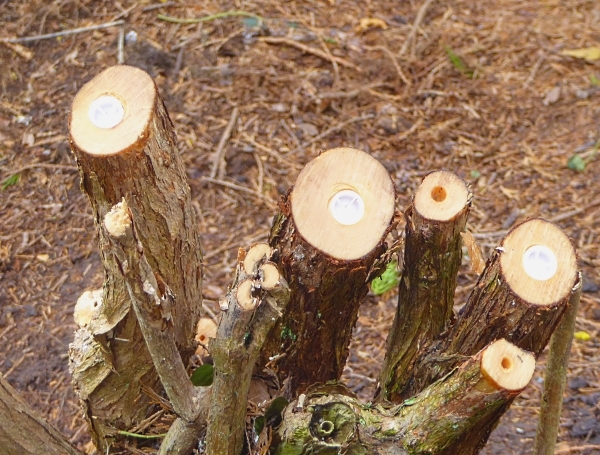 One shrub caught our eye, pruned well down, with the hollow centres of the larger stems neatly closed with plastic plugs. 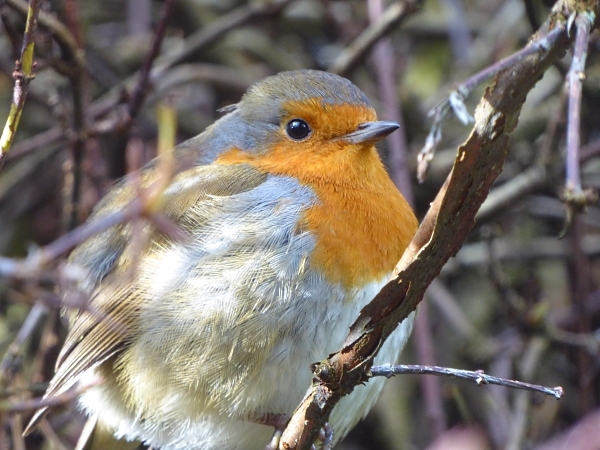 A very confident Robin was sitting not much more than arm’s length away. 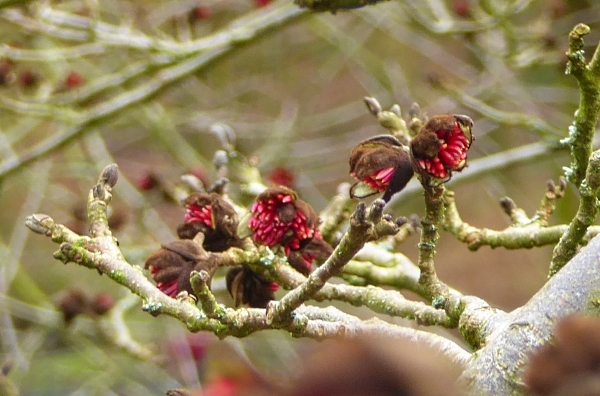 The Persian Ironwood doesn’t look interesting from a distance, just a low twisty tree, but from closer in we could see that it was flowering, with bursts of crimson stamens emerging from dark brown buds. Another bird watcher tipped us off that there was a Great Crested Grebe near the island, but by that time it was hailing so hard again that we didn’t want to hang around. 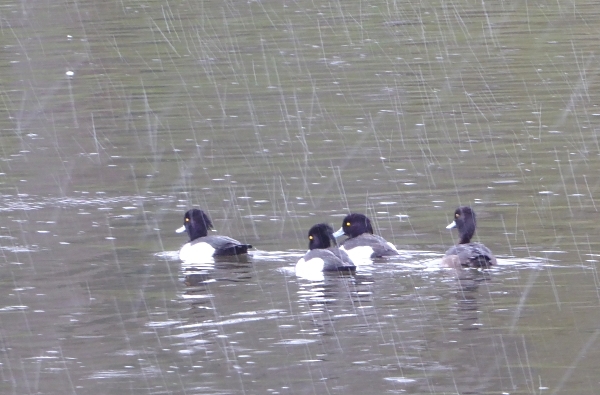 Even the Tufted Ducks appeared to be looking for shelter! Public transport details: Bus 82 from Liverpool ONE bus station at 10.10, arriving Aigburth Road opp Ashbourne Road at 10.30. Returned from Aigburth Road / Jericho Lane on the 82 at 2.03, arriving Liverpool ONE bus station at 2.20.